Why did you murder me? I don’t normally post about my diet and training, so prepare to learn about another facet of my geekiness. In fact, This is my first training and nutrition related post in 5 years of blogging. In this case, I felt that fasting for 16 hours every day with an 8 hour feeding window was a significant enough change to share my experiences. This could be a lot more impressive, at just over 1000KCal of rice, eggs, soya mince and veg. Sadly, it needs to fit in a 1.6l airtight lunch-box and I’m only aiming for 3400KCal a day. I couldn’t live without breakfast! As long as I can remember, I’ve struggled to function without breakfast. This worsened when I when I took up weights training. I began stuffing myself with everything between 2500 and 5250 KCals of food a day. Eating regularly and breaking my fast as soon as I got up helped me to wolf down some of the more obscene amounts of food. Aside from putting on a bit of belly fat, I became accustomed to eating regularly, eating a lot — and due to budgetary constraints, eating a lot of carbs. I quite sure my insulin sensitivity dropped as despite consuming three eggs and a sizeable bowl of cereal every morning, I felt famished by lunchtime. 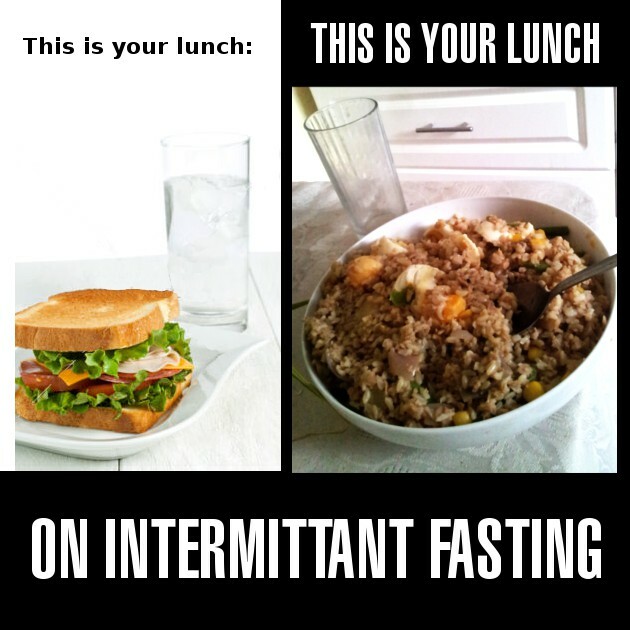 I started reading about intermittent fasting and found the idea of being able to eat a reasonable amount of food, maintain or even build some muscle and strength and cut my body-fat simultaneously very appealing. Following the leangains method, I calculated my basal metabolic rate, adjusted for activity and took some percentages based on the goal of body re-composition (+20% on training days, -20% on rest). The rest was willpower. On the first few days at work, I went on a feeding frenzy at lunchtime and gobbled up whatever sweets and biscuits happened to be lying around. This was especially bad when I had a supermarket meal-deal for lunch, including a sugary fruit-juice and crisps (which incidentally, with the right sandwich, adds up to around 1000Kcals.) I gradually adapted, drinking several cups of green tea in the mornings and sometimes not quite making it to 2 or 3pm, as I’d come hope late from martial arts training and only eat dinner at 10 or 11pm. I’m not going to fool myself; this couldn’t be further from a controlled a scientific study. I changed so many variables in the few weeks before I started this that anything could be responsible. Before I started fasting, I’d been taking the bus to work and eating large supermarket lunches with sugary fruit-juice. I’d recently started cycling to and from work and taking a packed lunch with low-GI carbs, vegetables and some protein. I’d also started doing martial arts training in the evening, which incorporates HIIT circuits – a change from sitting at my laptop when I got home (and a massive improvement, for so many reasons). It gets worse: Due to these other changes, I switched from a 4 our day upper-lower weights training spilt, to a 2 day push-pull split of my own invention. I could squat (& bench press, press, leg press, dips…) on Saturday, when I didn’t have to cycle the following day, rest on Sunday and deadlift (& pullups, power cleans, rows…) on Monday. From Tuesday to Friday, despite martial arts training and cycling every day, I could recover, in theory. One thing that remained fairly consistent was my my macronutrient balance. I tend to get just over 20% of my calories from protein, around 50% from carbohydrates and just under 30% from fat. The proportion of protein tends to rise to around 26% on days with a lower caloric intake, simply because I’m not adding loads of cheap grains to make up the calories. Maybe my diet isn’t good enough (if we take seriously advocates of very high proportions of protein and fat). I think it’s adequate, considering my limited budget. After all, a similar diet has allowed an 6′ 1″ (185cm) ectomorph like me who weighed just under 70kg to reach 79kg within a year, without a remotely high bodyfat percentage. Nope, I was sill about an inch of belly-fat shy of a well defined six-pack. After the first month, my weight hadn’t changed much. I weighed 78.9kg fasted before I started and I don’t believe I weighed less than 78 at at this point. I reduced my calories and cut out some unhealthier food sources. This included cheap peanut butter (replaced with whole peanuts) and whole-milk. While the peanut butter wasn’t that bad, the wholemilk was; despite containing a bit of high-quality protein, it is just saturated fat and sugar (lactose) suspended in water, along with antibiotics and bovine growth hormone in some countries. I will admit that during one of my past bulking attempts, I’ve consumed close to one litre of wholemilk a day, on the recommendation of strength coaches John Rippetoe and Jim Wendler. It works, yes, but only if you need to drink an extra ~ 640Kcals of mostly empty calories a day. I did take some time of training, spend two weekends visiting people but tried to match my enthusiasm for vices such as alcohol with gluttony, an one point eating an entire roast chicken to line my stomach with slow-digesting fat and protein before going out drinking. Despite telling myself I’d keep cutting until I hit a fasted weight of 75kg, I’ve decided to slam on the breaks and eat more again. I’ve had cravings for juicy steaks and rich, crispy pies and ice-cream recently, which may or may not be the result of just having lost about a kilogram a week. I’ll allow myself a few treats, but don’t want to go mad and fall into the trap of unsustainable crash-dieting. Go back to eating breakfast every morning? I actually don’t enjoy starting the day with bowl of grains and dried fruit any more. I still wouldn’t mind the eggs (and a 10oz bacon-wrapped steak for that matter! ), but that’s a different story. I enjoy being able to go longer without food, is research indicating a range of heat benefits aside from fat loss. However, this research is still in relative infancy. A considerable amount of research still supports meals spaced out over one’s waking hours. While I have seen photographic and anecdotal evidence of people reaching impressive body-composition goals on intermittent fasting, I have been unable to replicate this. I’ve become more fatigued and irritable, and have little to show for it in terms of fat loss. If I put on a significant proportion of body-fat the future, I might consider IF as one of a number of tools to help overcome this. By this point, there may be more conclusive research. At the moment, I’m physically active, have a fast metabolism and a healthy bodyfat percentage; I seem to reap no obvious benefits from IF (less obvious benefits would require blood tests, which may have to wait until I’m older and need them). I can see little point in continuing this experiment now. I'm a coder who occasionally also types things in natural language. This blog contains examples of such things going back almost a decade.